In 2008, I began a series of 12 tapestries, one to represent each month of the calendar year. Living in the Rocky Mountains of Colorado, the seasons are all visible and varied, so much so that the Four Seasons series tapestries, which had just been completed, did not seem to capture all that needed to be said about the passage of time. The final Calendar Tapestry was woven in 2016. Each tapestry is 18x18 inches, mounted on a fabric covered frame. This is the view of the street below my sitting room window: shadows in the January snow. The tapestry is 18"x18" and is woven in wool and mounted on a frame. Bare tree branches and a Robin, returning early with a hope of spring. 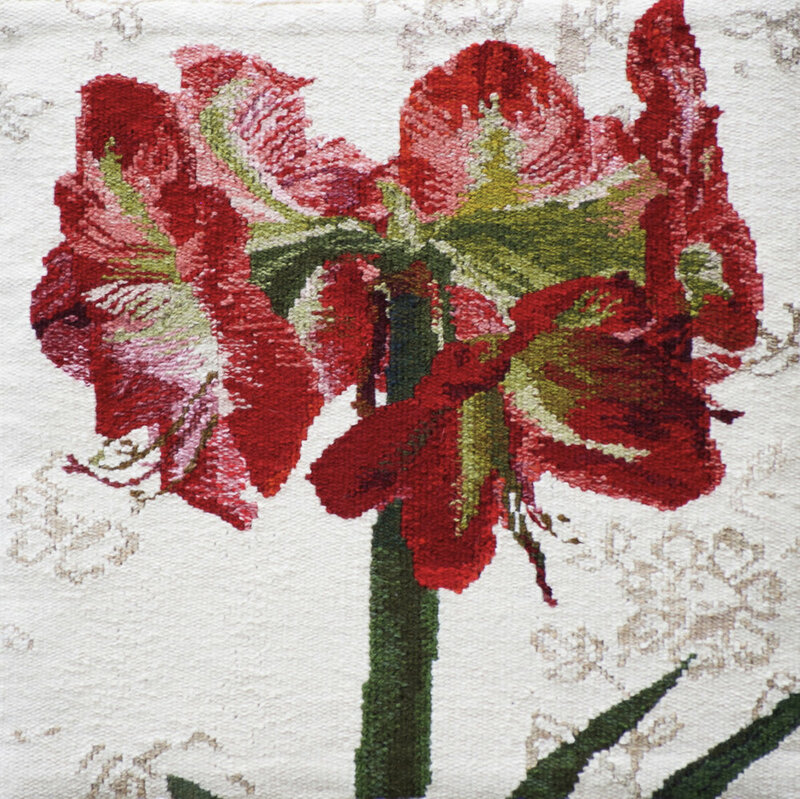 This tapestry is woven in wool and is 18"x18", mounted on a frame. A small iris, and crocus, from above. Spring! This tapestry is woven in wool and mounted on a frame. It is 18"x18". April is my birth month, so this tapestry is a bit of a 'selfie.' I had just learned to play "Blackbird" by the Beatles on my guitar, and the flowering crabtree in my yard was blooming. The tapestry is woven in wool, and is 18"x18" and mounted on a frame. This is a familiar scene where I live:the cows enjoying new grass, the greening of the trees, and the mountains, still with bits of snow, in the background. This tapestry is 18"x18", is woven in wool and mounted on a frame. One of the joys my husband and I share is fishing for trout in a mountain lake in our small boat. This tapestry shares that joy with the viewer. It is woven in wool, is 18"x18", and is mounted on a frame. This is my grand-daughter. A mountain girl, she can also find wonder in the ocean! I wanted to capture her joy in being new things. This tapestry is woven in wool. It is 18"x18" and mounted on a covered stretcher frame. August is known as the 'Dog Days of Summer.' This is our dog, Booker, retrieving sticks in the lake. 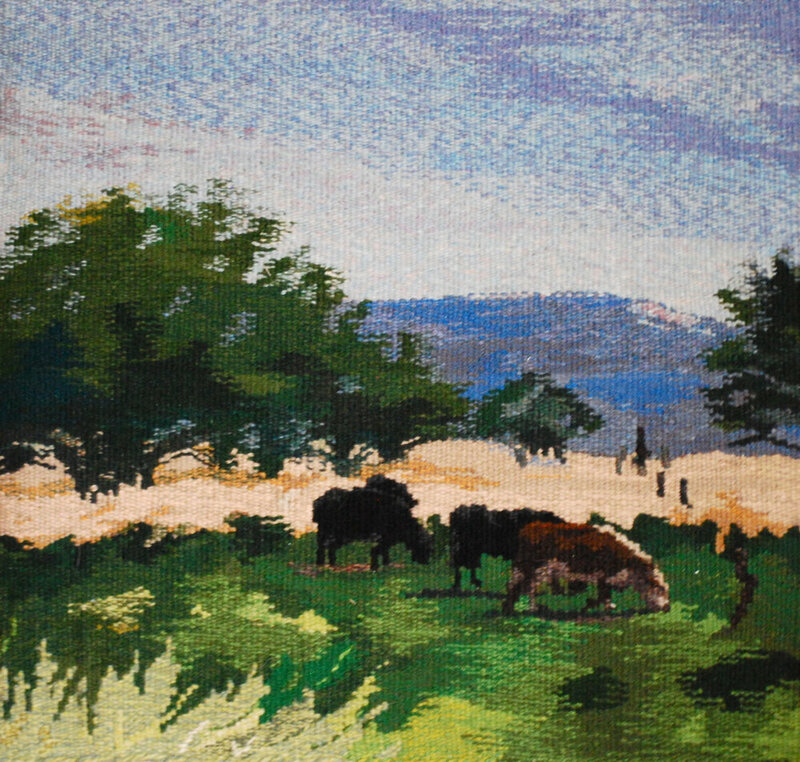 The tapestry is woven in wool, is 18"x18" and mounted on a stretcher frame. We live in a fertile mountain valley, known for the fruit orchards. September is the time to harvest apples and pears. This tapestry is 18"x18" and woven in wool. It is mounted on a covered frame. The Colorado mountains turn gold in October, with the Aspen trees showing off their beauty. We are often under the trees, cutting deadwood for our fireplace, and marveling at the bright blue autumn sky. This tapestry is 18"x18" and is woven in wool. The November nights are brisk, and the harvest moon shines brightly through the bare branches. This tapestry is 18"x18" and is woven in wool. It is mounted on a covered stretcher frame. I plant an Amaryllis bulb (or two) every year, and let its bright colors cheer me through the dark December days. It truly is one of the things I love most about this month, as it feels like a gift to me. This tapestry is 18"x18" and woven in wool. It is mounted on a covered stretcher frame.